The year started off at a gallop. In March we welcomed four guests from Wisconsin. Veterinarians Judy Batker and Chris Olson with whom I’d worked last year at the Citadelle branding horses. (A tale for another time.) Judy and her childhood friend Amy Armstrong, had asked me how they might be of service to our organization. They were enthusiastic when they learned that a current goal was to open a computer lab at the HHN Center, they recruited Amy’s daughter, Bailey (13) and Judy’s son, Seth (9). 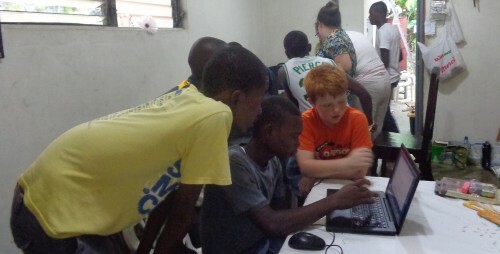 They arrived with several gently used laptops and security cables, and within two days we managed to transform the “dining-room” into a study/work space where teachers, Bailey and Seth immediately began working on lesson plans. Later when the rugby team arrived we were ready for introductions and our first class in computer skills. Initial timidity was soon replaced by much laughter. By the time our welcome visitors left they had been able to teach team members some basic computer skills and, perhaps best of all, they parted friends. Their addition of games and English books was a nice parting gift for our growing library. One of our team members, a second year university student, will be an instructor in the lab. In exchange HHN will help with his tuition. We have been favored by support of the San Juan Island Rotary Club (a connection made possible by my periodic work stays on Orcas Island), which helped us to acquire solar panels for the center thereby giving us a stable power source. We were able to purchase the panels locally and have them installed by the same Haitian company. A Limbe’ electrician who worked on the installation is now employed by us doing monthly maintenance on the system. In April we welcomed six high school students from the Good Hope Country Day School in the U.S. Virgin Islands. Their Social Studies teacher, Christopher Fletcher, had just finished teaching a segment on the Haitian Revolution. 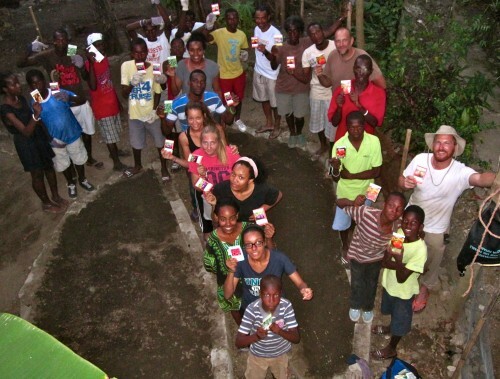 The students chose HHN and Limbe’ as a destination, where they worked alongside the Rugby team to reestablish our food growing garden at the center and also exchange culture and history with their Caribbean neighbor. When not focused on the garden, there were lively debates on the value of education and the study of history. We look forward to an ongoing exchange between these youths and envision a possible visit by our team to their home base. A welcome repeat, and inspiring, summer visit by Ellen Schreder helped the group she formed last year to sew cloth diapers and feminine hygiene products. She brought another sewing machine as well as over forty kits to distribute to young girls just starting to menstruate. Ellen was accompanied by a young nurse, Abigail Ahner. Abigail had produced an informative brochure explaining menstruation in clear language and illustrations. This brochure will be used for educating young girls at the local schools and church youth groups. The products we are producing have received a lackluster reception, but information and education should change that. 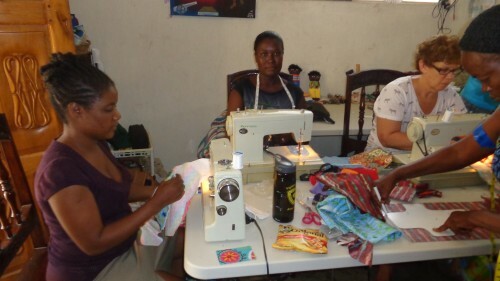 It is our goal to make this a lucrative business for the center sewing group. The very good news is that a fair trade shop in Olympia, WA has agreed to stock them on a trial basis. 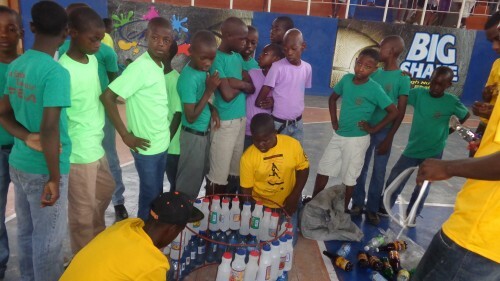 The June celebration of the 300th anniversary of the founding of Limbe’ provided an opportunity for our rugby team to further our goal of addressing the poor sanitation in town. They made eight trash cans, using recycled juice and water bottles and rebar. These were placed at various locations in our neighborhood, including the Museum of Guahaba. On the final weekend of the festivities we hosted a rugby team from Port au Prince and played the first friendly match on our home turf. The two teams had met earlier in the year at a three-day training at the new Olympic sports center in P-a-P. This was a chance for the boys to show their friends and family that four years of being the only rugby team in Haiti has not been in vain. We plan to host a similar training for new players in the north next spring. All in all, it’s been a productive year. We are currently discussing ideas for our annual New Year/Independence day event. We choose a theme for debate and invite community educators to come share a bowl of pumpkin soup while taking stock of the year past. Noramise moves forward thanks to your ongoing support, which is as persistent as our goal setting. Your time and resources are essential to our survival, so here’s a shout out for your help in 2016. P.S. We recently received word from our umbrella non-profit, A W.I.S.H., that they would be finalizing their operation at the end of 2016. Our heartfelt thanks to Michael Karp for his generous spirit and the invaluable assistance he has provided to so many very worthy causes over the years, an extraordinary accomplishment.